QL Resources Bhd’s purchase of 1.16 million shares in Lay Hong Bhd — a poultry company that the former wants to take private — is among the notable shareholding changes that took place between Oct 7 and 10. The acquisition triggered the mandatukry takeover offer obligation as QL Resources’ stake in Lay Hong exceeded the 33% threshold. This came two weeks after QL Resources proposed a conditional voluntary takeover offer for Lay Hong at RM3.50 per share. Filings with Bursa Malaysia reveal that QL Resources raised its stake in Lay Hong on several occasions between Sept 24 and Oct 2 at RM3.17 to RM3.50 apiece. Lay Hong’s net profit for the second quarter ended Sept 30, 2014, rose to RM6.29 million from RM909,000 in the previous corresponding period while revenue increased 14.2% to RM166.85 million. Over at Pelikan International Corp Bhd, Caprice Capital International Ltd emerged as a substantial shareholder after it bought 28.4 million shares or a 5.18% stake on Oct 8. Caprice Capital is reported to be linked to Paul Poh, a long-time associate of tycoon Tan Sri Quek Leng Chan. Two days later, Singaporean shareholder Chia Chor Meng sold 9.2 million Pelikan shares, reducing his interest to 40.31 million shares in the company. In July, Pelikan announced its plan to inject its stationery business, worth RM1.19 billion, into its 10.9%-owned Frankfurt-listed subsidiary Herlitz Aktiengesellschaft. Pelikan is expected to raise RM491.3 million from a private share placement and offer for sale of shares in Herlitz that it would receive, with part of the proceeds to be used to pare its debt. The key subsidiaries that will be injected are in Japan, Belgium, Germany, Switzerland, Mexico and the Middle East. The Employees Provident Fund ceased to be a substantial shareholder in glove maker Supermax Corp Bhd after it sold 1.38 million shares in the company on Oct 1 and 2, according to announcements on Oct 7 and 8. Supermax’s net profit for the second quarter ended June 30, 2014, sank to RM26.76 million or 3.93 sen per share, from RM35.48 million or 5.22 sen per share previously. This was achieved on the back of lower revenue of RM238.1 million, compared with RM330 million previously. The company attributed the decline to lower average selling prices — a drop of between 5% and 20% — across the group’s range of products, which was in line with lower latex prices. 62.25 million shares or a 22.4% stake in the company. Hap Seng Insurance is a unit of Hap Seng Consolidated Bhd. Meanwhile, Lim Nyuk Sang @ Freddy Lim ceased to be a shareholder after he disposed of 10.79 million shares in the company on the open market. 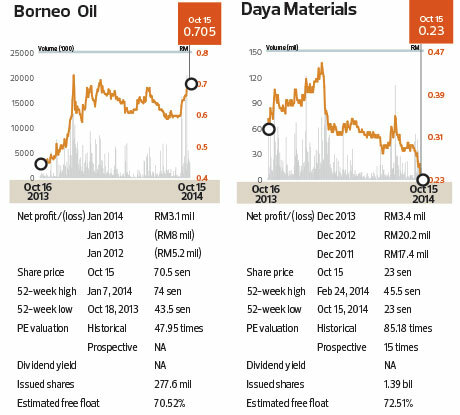 Daya Materials Bhd’s share price shed nearly 18% to 23 sen between Oct 1 and 15. Former president and CEO Datuk Mazlin Md Junid disposed of his remaining 63 million shares in the company on Sept 29 and 30 and Oct 7. Thereafter, he ceased to be a shareholder. Mazlin resigned as president and CEO on June 30. Penang-based property developer Tambun Indah Land Bhd saw its share price fall to RM2.11 on Oct 15 from RM2.50 on Oct 1. Chen Khai Voon ceased to be a shareholder after he sold 188,700 shares in the company. For the second quarter ended June 30, 2014, Tambun Indah registered a net profit of RM25.44 million, an 82% increase from a year ago. This was achieved on the back of higher revenue of RM127.96 million, compared with RM82.61 million previously. This article first appeared in The Edge Malaysia Weekly, on October 20 - 26, 2014.